Trade remained very firm for a small entry this week with lot more stock required to supply a growing demand from buyers province wide. STORE & WEANLING STEERS & BULLS: Maguiresbridge Producer 440kg Ch. to £955 (£217) 410kg Ch. to £865 (£211) and 300kg Ch. to £765 (£255) Lisnaskea Producer 450kg AA. to £885 (£196) Lisnaskea Producer 370kg Sim. to £700 (£233) 240kg Sim. to £525, 220kg Sim. to £400, and 150kg Sim. to £345. Clogher Producer 340kg AA. to £690, 300kg AA. to £680, 320kg AA. to £665, and 300kg AA. to £600. Lisbellaw Producer 320kg Lim. to £620. COWS & CALVES: Lisbellaw Producer Heifer & Heifer Calf to £940. WEANLING HEIFERS: Bellanaleck Producer 290kg Sim. to £740 (£255) and 300kg Lim. 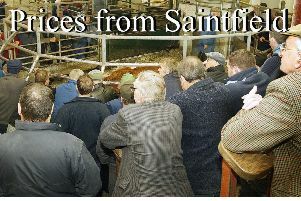 to £645 (£215)Lisnaskea Producer 330kg Sim. to £675, 300kg Sim. to £635, 290kg Sim. to £600, and 220kg Sim. to £450. Lisnaskea Producer 280kg Ch. to £545, 290kg Sd. To £490, and 370kg Her. to £485. Lisbellaw Producer 220kg AA. to £480.